It’s the most wonderful time of the year! The cherished annual tradition continues as we brighten the lives of people living with cancer and their families. 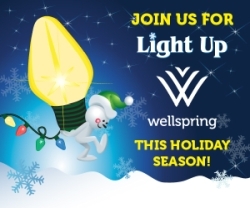 Help us Light Up Wellspring Birmingham Gilgan House. Join us on Thursday, November 29 from 5:00 – 8:30 p.m. for a holiday bake sale, silent auction, festive treats, refreshments and more! The official lighting ceremony will take place at 6:00 p.m., so please bring your family and friends. If you want to make a donation in support of Light Up, by purchasing a bulb, a strand of bulbs, a guiding star, a wreath or a holiday tree, please click here.